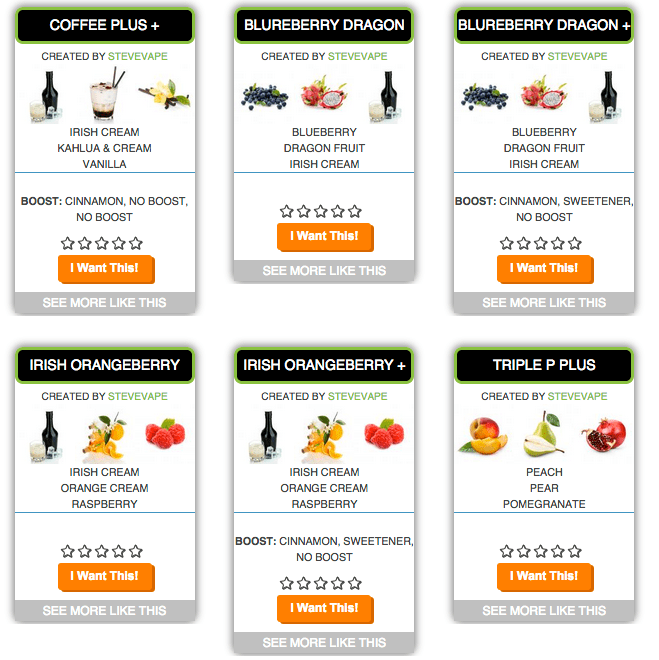 While some companies will concentrate on special segments of the market like NET Tobacco or chocolate and coffee flavors, most e-liquid menus all seem to have the same lineup. Fruit, Candy, Beverage, Desert, Tobacco, Nut, Savory or Sweet. Some even offer you the opportunity to create your own flavors by starting out with a base mixture of your preference of PG/VG mix with your own level of nicotine and then add whatever flavors are in their stockpile by percentage (30% of this, 25% of that and so on) until you reach the end with a total of 100% and then you go through the checkout process, pay you bill and wait for your special creation to arrive via Vapemail and pray your concoction is even vapeable. And I will be the very first to admit that when I have tried this in the past myself, the end results were just so very bad I swore off the process until now. My Liquid ID http://www.myliquidid.com/ contacted me to see if I would be interested in reviewing the custom E-Liquid creations they were now offering to the vaping public. As a result I received four 30ml bottles of E-Liquids that were created to my own specifications at no charge for the purpose of review (thank you Matt). 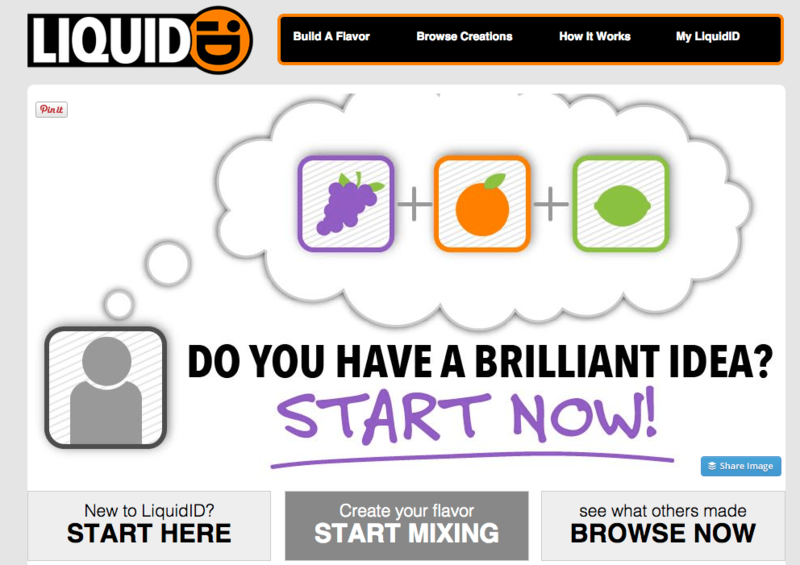 You enter the website and choose the Build A Flavor option from the menu at the top. There you are shown the forty (40) different flavors available to choose from ( Bakery, Fruit, Savory and Tobacco) and you may select up to three of those flavors for each custom mix. Once you have made those choices you are then offered the option of adding up to three “Boost” options to your creation. The boost options are Cinnamon, Menthol and Sweetener. You may also add Red, Green or Blue food coloring. The next step is to choose your bottle size, 15 or 30ml, then type of bottle you prefer, glass or plastic followed by your preferred nicotine strength which is from 0 to 24mg of nicotine in 1mg increments which is an option that I really like and then finally a 50/50 mix or all PG or all VG. Then you get to name your creation and then add “Created By…) to be printed on the label. The process is actually kind of fun. However, if you are not feeling all that creative, you can choose flavors that were created and named by others. So if you tried a recipe that a friend had created and purchased from them and you want get your own bottle of that flavor, you can simply locate that flavor on the website and order it for your own use. And if that is not enough for you, you can earn points toward free prizes such as E-Liquid per the following from their website. Now on to my own results. I spent some quality time on the Build A Flavor portion of the site and I “Created” four custom flavors from profiles that I tend to prefer. Here are the ones I concocted. There are some duplicate flavors being shown here that did not make it all the way to the checkout so these are the ones I ended up with. All 50/50 with 12mg of nicotine. As all of their offerings are made to order expect a 48 hour wait time before your order ships from California. Standard shipping is via USPS and shipping charges are calculated at checkout. The order itself arrived in just a few days in a padded shipping envelope and the plastic bottles were nicely sealed and had needle tips as is my preference. Each bottle had its own custom label showing the name I had chosen for each flavor, my name, pictures representing the flavors I had chosen and in print the flavor boost that I had added as well as being marked as containing 12mg of nicotine. Unlike the self created flavors that I had such terrible luck with in the past from different companies, each of these flavors were quite vapable especially after a week or two of steeping. I think this can be mostly credited to them keeping the number of flavors going into each mix limited to a maximum of three flavors plus a boost or two if wanted at the end to add a small amount of an extra flavor. And keep in mind that if you want just a 100% banana flavor for example, just add the banana flavor three times and you are taken care of. But that would take the fun out of the process. All of the flavors had a really nice amount of throat hit and vapor production. The IRISH ORANGEBERRY was the least successful (remember to blame me for the idea not the cook) as the Irish Cream seemed to dominate the other flavors but still a nice Irish Cream vape. The TRIPLE P PLUS for me was a real winner. The components seem to add up to a slightly tart fruit punch. In retrospect, I wish I had left out the sweetener and the cinnamon boost and then I think I would have been left with something more like the “Sweet/Tart” candy which would have been even better. COFFEE PLUS was pretty good as well. More like a Irish Cream with a shot of Vanilla added. The cinnamon if anything just affects the throat hit and not the flavor. And with the BLUEBERRY DRAGON we have a definite winner! A bit of Irish Cream and a definite taste of Blueberry both of which being brought together with the subtle flavor and awesome throat hit of Dragon Fruit and enhanced by some added sweetener. Can’t pick up the cinnamon much but it is there all the same. Just looking at the prices, I would just go with the 30ml bottle. Customer service is very good as well. I had some issues with their website at first so I contacted Matt and heard back from him almost immediately. I have heard the same comments from other people I know that have purchased from them. All in all, if you have the wish to create your own flavor, this may be the best place to partner with to give it a go. The way this is set up, you really can’t go too far wrong in my opinion. And you may end up being pleasantly surprised! I used the contact us on their page about not getting my order and it’s been 2 days and haven’t heard anything back. I even messages them through Facebook and got nothing. Do you have a customer service phone number for them?